There are two bed flats, and then there are two bed flats like these. One of our favourite recent properties was this beautiful, elegant apartment in Mayfair, marketed by Prime London Residential. Very traditional in style, Ryger House nevertheless exuded glamour with plenty of unique design features for us to get stuck into. Here are a few of our shots from the day. This luxurious bedroom uses warm neutral colours to create a boudoir level of comfort, with a feature wall to add some texture and great mirror placement. The use of light cleverly substitutes vertical windows and creates a soft, warm atmosphere. By contrast, the second bedroom opts for cooler, sophisticated grey tones. And the in-built storage is used to neatly partition off the sleeping area. The fireplace is beautifully balanced and framed by in-built shelving. And presiding over it all is an elegant art deco-inspired light fitting. The bathrooms may well be our favourite element to this lovely home. The use of this dramatic and striking marble gives this bathroom a focal point, even while it is countered by the serene smoothness of the bathtub before it. In a completely different style but just as immaculate is this second bathroom. Using a different type of very distinctive marble, the overall effect is of purity and serenity. Communal spaces are not neglected: This landing features a dominant light fitting amplified by a full wall mirror but not distracted from with a glass banister which keeps the space as open as possible. And the lower level benefits from the mirrored wall above it too, giving a view on the ascent to the next floor. A good width keeps the lower landing very open and spacious. Just look at that demure facade, hiding all that opulence inside! VIRTUAL PROPERTY STAGING: OUR NEW SERVICE FOR 2019! If you’re trying to sell your property in London, or rent it out, you need to make it look good for photos. But what of vacant, empty properties? Sometimes it’s hard to see beyond the blank walls and to visualise how one can best make use of the space. Sometimes it’s hard to make a vacant property look like a home. 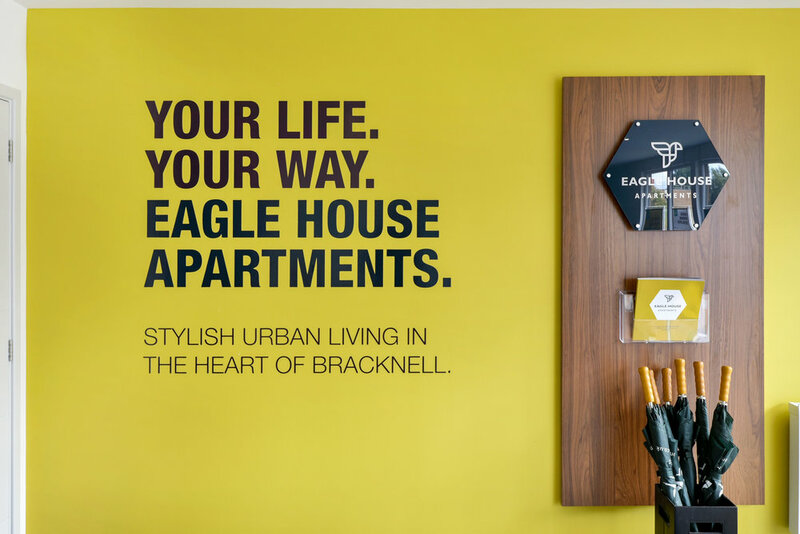 If you have a new development and you are ready to start selling your completed apartments, you are not just selling a flat - you’re selling a lifestyle. And a newly painted, empty space doesn’t scream “buy me”. It was with this in mind that we added our newest service to our repertoire for 2019: Virtual Property Staging! It can be very expensive to kit your property out with temporary furniture, which may not be the best choice for your situation anyway, so here’s your chance to do it in virtual reality for a fraction of the price. We take photos of your home, displaying the rooms to their best advantage to show off the space, and then we digitally add furnishings, from beds to tables to plants to artwork. Abracadabra, your property no longer looks empty and soulless, and your potential new buyers or renters can imagine themselves settling in to their new home. We may even give them interior design inspiration, you never know. Check out these examples of how we can furnish your home digitally! Contact us for a quote or to chat about what we can do for you. The only good thing to be said for the early disappearance of the sun at this time of year is that it’s a lot easier to do night photography! In the height of summer we wait until well after 9pm to get our shots of beautiful lighting in the dark. In this case, we visited our friends at Prime London Residential in order to show off their bright and welcoming office space. We always enjoy getting both day and night shots to highlight the differences, and this shoot was no exception. Speaking of being ahead of the game, the lovely people over at Emma’s Estate Agents in Streatham have been busy making their shiny new office all festive. We’re not talking just throwing some tinsel around either. No, this is stylish and sophisticated. We were only too happy to help capture their pretty creation. The one good thing about shorter days is you don’t have to wait until 10pm to get some night photography on the go! And you can use the low light to easily capture movement with blurred lights on vehicles travelling along. As much as we enjoy property interiors, sometimes it’s nice to mix things up a bit and photograph something different. Luckily for us we have a very exciting new-ish client, Lavastar! (www.lavastar.co.uk). They are an award winning signage company and produce large format printing, stunning site hoarding and bespoke building wraps all around London and nationwide. They have a background in marketing and design and it shows! We’ve been on night shoots, to Wembley, to Bracknell and even all the way to South Wales to capture their work. No one shoot is the same and we really like it that way!